At the start of last year, I started to run my pension funds personally. In line with normal advice, I put circa 70% of the available funds in Vantage LifeStrategy 100% Equity Accumulating Index Trackers, and the balance i’ve used to bet on a few companies I believe have a rosy long term future – while being fully aware of likely swings of the US Dollar vs GB pounds. I’ve lived long enough to see that cycle between $1.40 and $2.20 to the pound – currently nicely in the middle and with holdings I can leave in situ waiting for the right position to enact an exit – albeit that’s not for many years into the future. At the moment, my total fund is up 9.05% in the year i’ve been running it. The shares portion of this has come in +17.68% year to date (touch wood – profit of £21,871.99). The sources that contributed to the increase in the fund are as above. In the early days, I did bet on a few others but kept the shareholding small until I had visibility of what they were doing. When they weren’t giving meaningful return, or where I felt I didn’t understand the company direction (strategically) well enough – or learnt their susceptibility to unfounded competitor rumours – I unloaded them. That applied (for various reasons) to ARM, Baidu, Red Hat, Salesforce.com, Splunk and Netflix. At this stage, i’ve retained positions in Google, Amazon, Tableau Software, Apple and… Facebook. I did buy some Facebook shares in the early days after it’s IPO, but unloaded them at a slight loss while they were in the $20’s. I’ve now bought back in at $69 – largely because Mark Zuckerberg’s purchase of WhatsApp, and the fact he’s put the WhatsApp CEO – who is vehemently against advertising – onto the Facebook Board. I thought this was brilliant, as advertising is the major current source of Facebook’s income, and there was a willingness to put someone up there that will push an alternative, subscription based model. A good sign that Facebook are willing to be radical with their business models, and not follow the normal high technology malaise of clinging to a failing business model into oblivion. I always think that the Advertising Industry is naive to think their next frontier is the screen of people’s mobile phones; it’s a bit like having a kiddie jumping up and down in front of the TV when you’re trying to watch something. WhatsApp currently charge $1/year for the instant messaging service, and at that level, there is even scope for friends (or vendors) to offer to pay the subscriptions of large numbers of users. Liquid Metal and GT Advanced Technologies were a small punt based on hearing about various Apple licensing agreements two years ago, and then seeing Apple employees start filing patents on the associated materials just ahead of contract renewal due dates. Liquid Metal is likely to be used for the carcass of new iPhones (without the need to mill aluminium as at present) and GT Advanced Technology supply very resilient Sapphire screens large enough for the display surface of same. Those shares turned out to be quite volatile, so I did an exit stage left on profits of 30.9% and 24.2% respectively – within 3 weeks of their original purchase. Google shares will split in April, improving their liquidity. Amazon have had a recent fall, but i’m confident that they’ll recover 20-25% in the next 2-3 months. 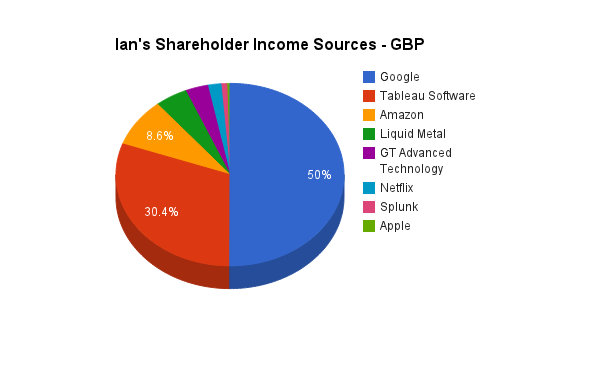 Tableau Software are just about to dilute things a bit with a new share offering, but my returns are still very good (not too far away from 100% returns for the 218 shares I still have). Apple are a blog post all by themselves, cursed by Analyst expectations of slowing growth (despite ratcheting up their market share relentlessly, plus earning 70% of the mobile industry profits) and discounting the likelihood of laying another category of Golden Egg, as they’ve done for iPod, iPhone and iPad already. Quite funny when Amazon trade at huge multiples on the suspicion that their conveyor belt will magic Golden Egg league profits as soon as Jeff Bezos decides that’s what he wants. And Facebook is a wait and see. There are three potential IPOs i’m looking out for, but that apart, the strategy is “Long Term Buy and Hold”. Working well so far, touch wood.